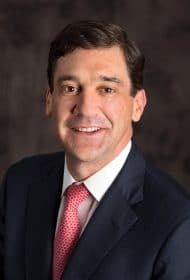 As one of the largest independent advisory firms, Meridian Compensation Partners is uniquely positioned to guide committees through pivotal events such as IPOs, spins, or separations where a company is entering the public markets. 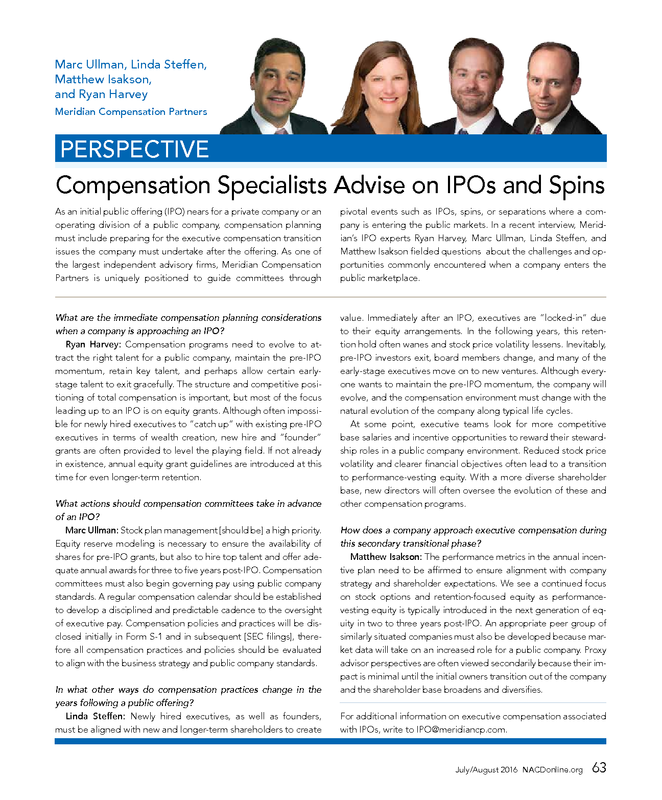 In a recent interview, Meridian’s IPO experts Ryan Harvey, Marc Ullman, Linda Steffen, and Matthew Isakson fielded questions about the challenges and opportunities commonly encountered when a company enters the public marketplace. What are the immediate compensation planning considerations when a company is approaching an IPO? 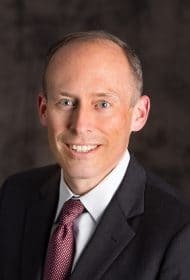 Ryan Harvey: Compensation programs need to evolve to attract the right talent for a public company, maintain the pre-IPO momentum, retain key talent, and perhaps allow certain early-stage talent to exit gracefully. The structure and competitive positioning of total compensation is important, but most of the focus leading up to an IPO is on equity grants. Although often impossible for newly hired executives to “catch up” with existing pre-IPO executives in terms of wealth creation, new hire and “founder” grants are often provided to level the playing field. If not already in existence, annual equity grant guidelines are introduced at this time for even longer-term retention. What actions should compensation committees take in advance of an IPO? Marc Ullman: Stock plan management [should be] a high priority. Equity reserve modeling is necessary to ensure the availability of shares for pre-IPO grants, but also to hire top talent and offer adequate annual awards for three to five years post-IPO. Compensation committees must also begin governing pay using public company standards. A regular compensation calendar should be established to develop a disciplined and predictable cadence to the oversight of executive pay. Compensation policies and practices will be disclosed initially in Form S-1 and in subsequent [SEC filings], therefore all compensation practices and policies should be evaluated to align with the business strategy and public company standards. In what other ways do compensation practices change in the years following a public offering? Linda Steffen: Newly hired executives, as well as founders, must be aligned with new and longer-term shareholders to create value. Immediately after an IPO, executives are “locked-in” due to their equity arrangements. In the following years, this retention hold often wanes and stock price volatility lessens. Inevitably, pre-IPO investors exit, board members change, and many of the early-stage executives move on to new ventures. Although everyone wants to maintain the pre-IPO momentum, the company will evolve, and the compensation environment must change with the natural evolution of the company along typical life cycles. At some point, executive teams look for more competitive base salaries and incentive opportunities to reward their stewardship roles in a public company environment. Reduced stock price volatility and clearer financial objectives often lead to a transition to performance-vesting equity. With a more diverse shareholder base, new directors will often oversee the evolution of these and other compensation programs. How does a company approach executive compensation during this secondary transitional phase? 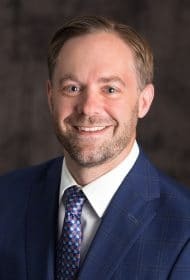 Matthew Isakson: The performance metrics in the annual incentive plan need to be affirmed to ensure alignment with company strategy and shareholder expectations. We see a continued focus on stock options and retention-focused equity as performance-vesting equity is typically introduced in the next generation of equity in two to three years post-IPO. An appropriate peer group of similarly situated companies must also be developed because market data will take on an increased role for a public company. Proxy advisor perspectives are often viewed secondarily because their impact is minimal until the initial owners transition out of the company and the shareholder base broadens and diversifies. For additional information on executive compensation associated with IPOs, write to IPO@meridiancp.com.